Although the end result is the same in terms of the success rate of both procedures, there are a few differences between LASIK and PRK. In general, patients who have PRK need to be more patient than those who have LASIK, as visual acuity returns more slowly after PRK when compared to LASIK. More specifically, the differences between the two procedures lie in the pre-operative regimen, the actual surgical technique, the post-operative medication regimen and the healing time. Below, we’ll explore the similarities and differences between the two procedures in more detail. For both procedures, it is recommended that patients discontinue soft contact lenses 2 weeks prior to the surgery and rigid gas permeable contact lenses for 3 weeks prior to the surgery. LASIK and PRK patients are asked to use rewetting drops 4 times a day, starting 1 week prior to the procedure. Patients for both are also asked to start antibiotic drops the day before the procedure. PRK patients start Neurontin pills the day before the procedure to help alleviate post-operative discomfort. Vitamin C is also started prior, and continued after, to assist in healing. This is not necessary for our LASIK patients. Click here to learn what to expect on the day of your free LASIK consultation. Click here to learn what to expect on the day of your free PRK consultation. For both procedures, the excimer laser is used to gently sculpt the cornea to correct nearsightedness, farsightedness, and astigmatism. Both LASIK and PRK take less than 5 minutes per eye. In LASIK, a femtosecond laser is used to gently create a flap of the topmost layer of the cornea. Dr. Mandel delicately lifts this flap and then the excimer laser is used to sculpt the cornea. In PRK, there is no flap-creation. Instead, a special vibrating brush is used to gently remove the topmost layer of the cornea. Once that’s complete, the procedure is the same as for LASIK – the excimer laser is used to reprofile the cornea in both procedures. 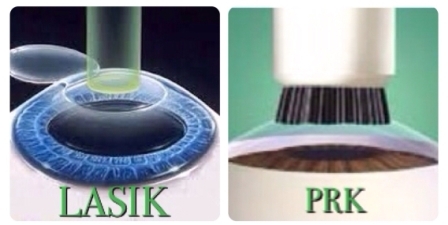 In PRK, after the laser is complete, a bandage contact lens is placed on the eye. This contact lens stays in place for approximately one week to allow the epithelium of the cornea to regenerate. Click here to watch Dr. Mandel perform a LASIK procedure. Click here to watch Dr. Mandel perform a PRK procedure. Both LASIK and PRK patients use antibiotic drops for 1 week after the procedure. We also recommend using natural tears as needed for the first few months. LASIK patients use steroid eye drops for usually 10 days to 2 weeks after the procedure. PRK patients use these same drops for the first few months. PRK patients also need to take Vitamin C and wear UV 400 protective sunglasses for 6 months after the procedure. We call LASIK our “immediate gratification” procedure, as visual recovery is almost instantaneous. Almost all of our patients go back to work, drive and return to most of their normal activities the very next day. The healing time with PRK takes a bit longer. During the first week the cornea is healing underneath the bandage contact lens so vision can be slightly blurry. We recommend increasing the font size on computers and smart phones. Once the bandage contact lens is removed, vision slowly starts to improve. Most PRK patients go to work the first week but day #3 is the day we recommend patients have flexibility to leave work early as this is the day that discomfort is most likely. For some patients, PRK is the only option. Some patients have corneas that are not thick enough for the LASIK procedure, so they only qualify for PRK. However, patients who qualify for LASIK also qualify for PRK. In those cases, it’s a personal choice. At the time of your free evaluation, Dr. Mandel will educate you about both procedures and guide you to make the right decision for YOU. A corneal flap is created with LASIK. There is no flap created with PRK. The healing time takes longer with PRK compared to LASIK, which means that visual recovery is slower as well. Post-operative medications are used for longer with PRK compared to LASIK. That said, the end results are the same for LASIK and PRK. In Dr. Mandel’s hands, our patients have the same chance of achieving 20/20 or better with PRK as they do with LASIK. To learn more about these 2 vision correction procedures and find out which one is best for you, call us to schedule a free consultation with corneal specialist, Eric R. Mandel, M.D. at 888-866-3681.